Spring is already around the corner, and it’s time to make sure that your landscape is ready for the change in weather! Spring is already around the corner, and it’s time to make sure that your landscape is ready for the change in weather! 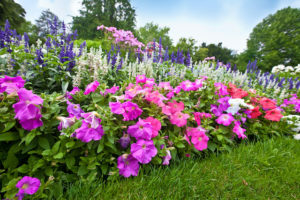 Having a great looking yard and landscape starts with excellent preventative care throughout the season, particularly in the early days of the season. To help ensure that your landscape is at its best, make sure to follow these five tips. Over the winter the debris in your yard can quickly add up. Not only is there likely to be branches, brush, and old leaves but you may find some unruly weeks and other mess that the winter winds blew in. Make sure to wear thick gloves as you begin the cleanup process. When possible, save any organic matter to add to your compost to help create more fertilizer for the future. Raking through your entire yard will help break up any clumped grass and soil while ensuring that old leaves, pine cones, twigs,and acorns are all removed. Not all plants and trees will need to be pruned in spring, some should be done over fall and winter, but there are still several types of plants that will need to be trimmed up. Not only can pruning help ensure that trees and shrubs keep a good shape and size, but it helps keep them healthy as well by removing weak and unhealthy limbs. Each spring ensuring that the edges of your landscape are defined is a great way to help create boundaries between your lawn and landscaping. This keeps grass from growing into flower beds and keeps everything looking neat and clean. Adding mulch is essential from season to season, In spring and summer, it adds a valuable layer of insulation to young and growing plants that might be affected by the cold nights. In summer and in dryer months it can help retain moisture and keep roots cool and protected from the excess sun. When possible, plan your fertilizing schedule for before or after the first light rain of the seasons as it will help it to absorb better into the soil. As the last step, adding fertilizer is a great way to amp up the nutrient levels of your soil and give your landscape the boost it needs to launch into a great spring growing season. This entry was posted on Friday, February 8th, 2019 at 1:09 pm. Both comments and pings are currently closed.